Just order your sample package of the TrueLens Premium Monthly Multifocal lenses: you will be sent a pair of comfortable monthly lenses from Mister Spex to try on at home. Mister Spex offers high-quality contact lenses at unbeatable value for money with its own brand TrueLens. These premium lenses are characterised by their comfortable wearability. With thanks to the innovative ComfortMoist technology the TrueLens Premium contact lenses are particularly oxygen permeable and are composed of a small amount of moisture. The improved oxygen circulation and moisture retaining wetting agent in the lens solution ensure your eyes are hydrated up to 30 days at a time - day and night. 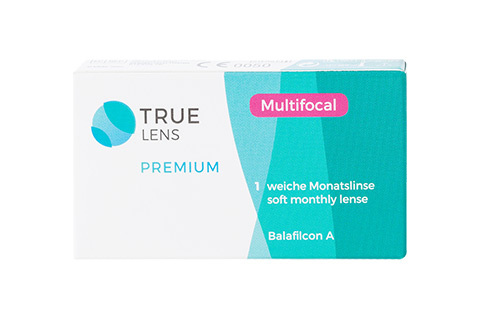 The TrueLens Premium Monthly Multifocal is a high-qualtiy multifocal lens that has been specifically developed for those who are long-sighted due to age. This lens creates the perfect eyesight for viewing things near, far and inbetween. The extra high oxygen permeability and the small amount of moisture ensure the optimal hydration for your eyes, even when long-sighted due to age. The thin use of high-quality silicon hydrogel supports the comfort of wearing and inserting the lenses.